The father of a teenager who died after taking ecstasy has called for tougher laws controlling dance music events. Morgan Miller-Smith, 16, from Conwy, suffered a heart attack after collapsing at a rave in October 2017. Coroner John Gittins recorded a conclusion of death by misadventure at an inquest in Ruthin. Morgan's father Brian Miller said there needed to be better security and medical care for young people at such events. 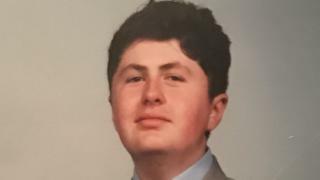 The Ysgol Aberconwy pupil had been studying for A-Levels in maths, further maths and business studies and dreamed of working on the New York Stock Exchange. However, he took two yellow ecstasy tablets - known as bit coins - when he was among the 450 partygoers at HP Fest on a farm in Gwytherin, near Abergele. He collapsed and died from ecstasy toxicity while being taken to hospital. Mr Gittins told the inquest Morgan had struck him "as a young man with a sensible outlook for the most part". "Sometimes people in their lives make bad choices and on this occasion Morgan, unfortunately, made a very bad choice," he added. The inquest heard the event met all licence requirements and some of the measures in place went beyond legal requirements. A professional security team searched everyone on entry and there was also a private ambulance on site. The event organisers and the farm owner said they would not hold such an event again. "If the ambulance service that was there on-call had included paramedics, they might have been able to give [Morgan] an [intravenous medication] straight away. "There were six security guards for 450 people. That means each security guard was trying to look after 75 children. Would you let a kindergarten do that? No." Mr Miller said Morgan had previously spoken out against drugs and added: "He was so anti-drugs, it was ridiculous. When we found out, it was such a shock." Morgan's stepmother, Marion Miller, said the family were "devastated". She added: "We thought we were good parents and knew what was going on in their lives, but we didn't have a clue. "You can only rely on education. "